Let's talk about Organization today! For those of us who need some inspiration and motivation, I rounded up some awesome Kids' Toy Storage and Organization Ideas! Please, please tell me I'm not the only still wading through the chaos of the post-Christmas-gift toy explosion. My girls are blessed to own a large variety of toys...everything from Barbie to American Girl to Polly Pockets and Lego Friends. But our 1970s Colonial is on the small side, with a limited amount of storage, and a dedicated play space that is open to the rest of the home. It's time to donate some items and rearrange others. Are you ready? *The source for each project is listed below the photo. Please be sure to RePin from the original source! Love this Industrial look. Great in a boy's room? Expedits on their sides? Great spot for a dollhouse! Another unique storage option for Legos! Corral all those dress-up outfits! Step ladder and cubbies-- super cute! Hope this post gave you a few new ideas to try out in your own home? What's your best tip for organizing kids' clothes? 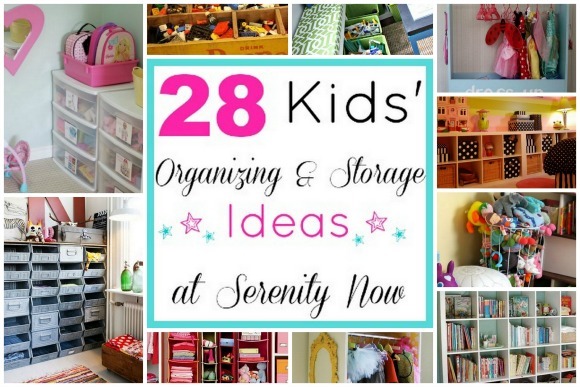 What a great list of organizing ideas! Thanks so much for including mine in your list! Have a great weekend. Thanks so much for including my fabric labels! I love that first picture. And I'm sort of obsessed with the Legos storage. I think I will need that in a couple years.